Je reprends le texte vu sur Aeronet. France’s ICAO-compliant Private Pilot Instrument Rating, first revealed in the May enews of IAOPA Europe, has been formally announced at the Paris Air Show by AOPA France, the Direction générale de l’Aviation civile (DGAC) and the French Aero Clubs Federation (FFA). 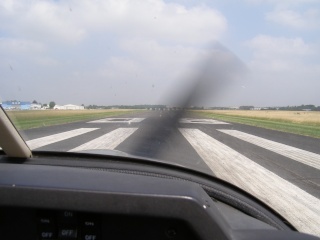 The new IR, for which only a single written examination on pertinent topics is required, means that French pilots can obtain the benefits and protection of an IR without going through the nonsensical theoretical knowledge requirements which have hitherto made European IRs unobtainable for 98 percent of private pilots. Holders of FAA IRs will be able to convert them to French IRs easily and cheaply. While the new IR will be valid only in France, IAOPA is pressing for bilateral agreements on recognition from other European countries. If enough countries recognise and adopt a French-style IR it may be possible to head off EASA’s plans on instrument flying, which are unlikely to improve on the current situation. IAOPA Senior Vice President Martin Robinson has written to the UK Civil Aviation Authority with details of the new rating. The French IR was outlined to IAOPA by Emmanuel Davidson of AOPA France at the Regional Meeting of IAOPA Europe in Friedrichshafen in April. The credit, he said, was mostly due to M Patrick Gandil, Director General of the DGAC, a private pilot who had been unable to take time out to study for the JAA IR exams. M Gandil travelled to the USA in May to look at the FAA IR and flew with Bruce Landsberg, head of the AOPA Foundation. In France, fewer than three percent of private pilots hold an Instrument Rating – in the UK, the figure is around one percent. A joint study by AOPA and FFA showed that more than 3,000 French pilots would like to train for an IR(A) in the next 18 months if they could be trained in a manner resembling the one used by the FAA. *JAR-FCL rules assume that only commercial pilots could be interested in an Instrument Rating, and the IR was made part of the professional training. It takes an average of one year of study to be able to take the written exams, with most students electing to take ATP writtens instead of IR exams, as they are easier. *The total cost of an IR exceeds €20,000. “This means that an Instrument Rating is nearly impossible to get for a pilot that has a job and a family,” M Davidson says. The new IR will allow the pilot to fly on instruments to the same minimums as JAA IR holders. It allows French PPL holders to fly IFR on French registered airplanes in French airspace, and there is provision for FAA IR holders to validate their US IR on their French license – if they have 100 hours on instruments (including sim time) they simply need to fly a ‘skills test’ at an approved FTO. The theoretical knowledge exam calls for the student to answer 150 questions on air law, radio comms, IFR-related human factors, instrumentation and radio navigation, flight planning, flight following, and meteorology. While an accredited FTO must be in charge of the training, pilots can do the flying in their own aircraft, or in an aero club plane, which further drives down costs. The first French candidates for the new rating should be taking their written and practical exams as early as September. The way is open for other European countries to accept the French rating, given that it is ICAO-compliant, by making an agreement with France under which French rated pilots could fly into other countries. M Davidson says: “If enough European countries accept the French rating, EASA could decide to adopt a system that is already functional and has been proven as a functioning alternative to its own plans. Je suis tout de même curieux : parmi vous quels sont ceux qui se sentent concernés ?